We have quite a few projects in progress at the moment but we can't share them until they are finished. So, while we're waiting to wrap those up and load them on the blog, I thought it would be cool to share some other creative stuff I get up to when I'm not stuck in front of the computer. I've been making some unique gift tags and other stationery items like notebooks and notepegs. 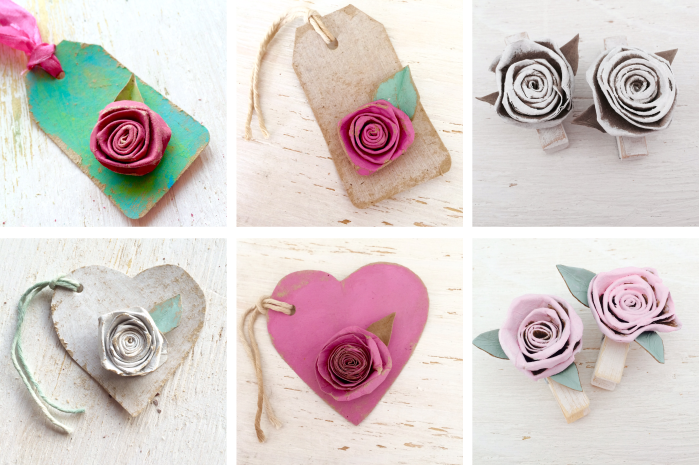 Each one is hand-painted, distressed and individually constructed from recycled stuff, mainly loo paper roll inners, discarded board scraps, string and ribbon. Next weekend (5th and 6th September) my handmade recycled goodies will be available for sale at a Sip and Shop Trunk Show in Forest Hills, along with lots of other handmade goodies by other creatives. So go along and indulge your artistic side, and your purse. You can see more of my handmade items on my Whimsy-Lou Facebook page. Have a great weekend!